Every computer is always at risk for unauthorized access and intrusion, however, businesses with sensitive and private information are at a higher risk. While the occurrence of intrusions may be rare, this can be a costly problem for any size business as confidential and important information may be stolen or destroyed. It makes any organization vulnerable to theft or even legal action. Forward Slash Technology can help improve your computer network security by using firewalls and intrusion detection systems. Firewalls are set up at multiple levels to provide protection for servers, networks and individual devices. At Forward Slash Technology, we can configure and manage firewalls and intrusion detection systems for small, medium, and large size businesses located throughout the St. Louis area and around the country. As a local IT company, we understand the importance for businesses to operate using fully secured networks. We can utilize our knowledge and experience to ensure your business' network is properly secured and protected from intrusion. To learn more about how our firewall configuration services or intrusion detection systems can help your business, please contact our IT company today. At Forward Slash Technology, one of the computer network security services that we offer for small and mid-sized businesses is to implement and monitor intrusion detection systems. Intrusion detection systems monitor network and system activities in order to prevent attacks and malicious activities that can come from within a network. Typically, intrusion detection systems will notify the network administrator when suspicious activity has been detected. In some cases, the intrusion detection systems can take action when problems are detected such as barring a user or IP address from accessing the system. Intrusion protection systems can be a good start to improving your company's network security. However, these systems do have some limitations such as an inability to compensate for weak identification and authentication mechanisms, the inability to compensate for weaknesses in network protocols, and the inability to conduct investigations of attacks without human intervention. Because of these and the other limitations of intrusion detection systems, it is important to work with an experienced IT company for implementing and monitoring your network security on a regular basis. To learn more about network security and to receive a customized computer network security plan for your business, contact our IT company. 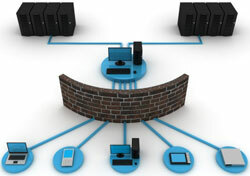 A firewall is another important part of computer network security. Like intrusion detection systems, firewalls can help strengthen any business' network security. However, firewalls differ from intrusion detection systems largely because they look outwardly for intrusions into a network in order to stop them from happening. A firewall typically acts as a barrier to prevent unauthorized access to a network. When implementing a firewall as part of your network security system, it is important to understand that a firewall must be configured properly in order for it to be effective. Steps involved in proper firewall configuration include setting firewalls to monitor incoming and outgoing packets, utilizing adequate firewall hardware or software for your needs, and standardizing wireless connections on a WPA. At Forward Slash Technology, our experienced IT professionals understand the importance of proper firewall configuration as it relates to network security issues. With all of our computer network security services, we can ensure that your business avoids major security breaches and other network problems in order to keep your business running smoothly.